Guess what?! I’m still pregnant! And what does that mean? It means I’m still working on that little baby dress. I’ve made it past the two decrease rounds, and I’m now working on the 11th pattern repeat. 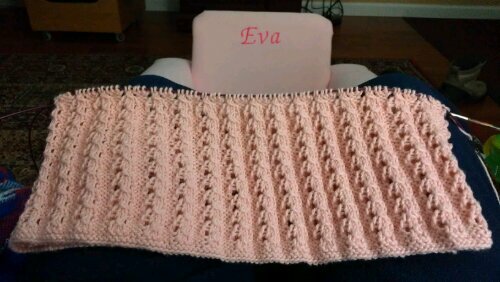 At this point, I’m supposed to knit straight until the skirt measures 21 cm. I have about 13.5 cm at the moment. I can’t wait to get to the bodice. The skirt isn’t necessarily hard, but it’s quite tedious! I have to pay extra attention during the yarn over rounds since I always manage to omit one or more accidentally. Can you tell I’ve been tinking hundreds of stitches? Categories: Knit | Tags: baby, cotton, dress, handmade, knit, lace, linen, pink | Permalink. May 9th. Only two more weeks at the most to go!